Happy Wednesday, everyone! I hope that you are having a great middle of your week! My hubby has the day off today instead of his usual Friday, so we are going to hang out together and do some errands/fun things. That should be nice! I have a very clean and simple card to share with you today! 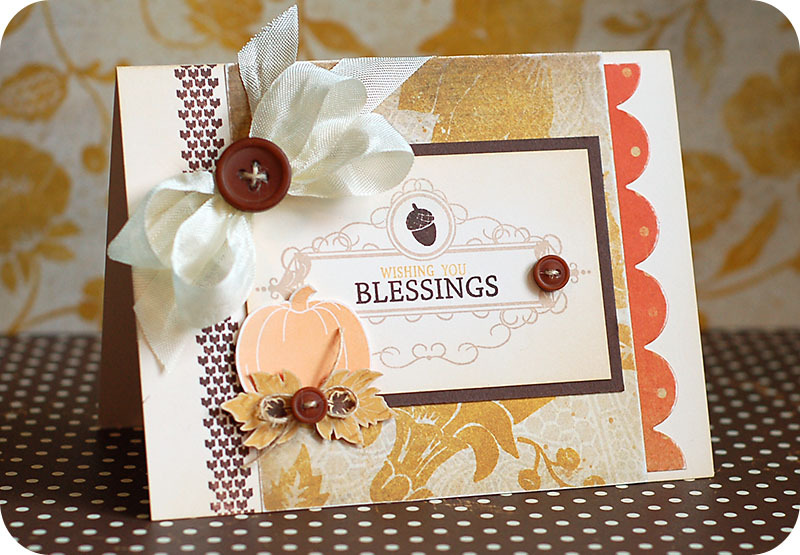 I love that the sentiment on this card can easily be used for friendship, but it also has a "give thanks" feel to it for this fall season. I also picked colors that were appropriate for the season as well. Here is what I created! Instructions: Make card from white cardstock, then round the bottom corners. Stamp the three dotted circles to the front, then stamp the sentiment below them. Tie a twine bow and adhere it to the middle. 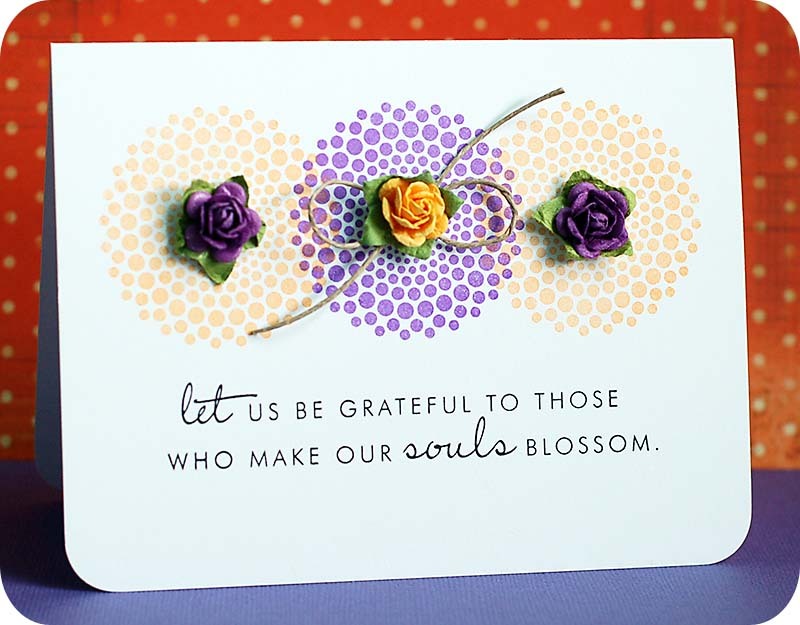 Add three opposite colored flowers to each stamped circle to finish. Hey there, everyone!! I hope that you had a wonderful rest of your weekend and a great start to your week! There is definitely a chill in the air and the fall colors have settled in up here in Missoula. The colors are beautiful, and I will be shooting some engagement sessions in them very soon (like- this week or it isn't going to happen! Tee hee!). I also hope that the colors will last just a couple more weeks until my mom is home, because I want to get some family photos of us all together. We shall see if that happens or not...the fall colors go QUICKLY in this area! Instructions: Make card from blue cardstock, then round the bottom corners. Cut white paper slightly smaller, then round the bottom corners. Wrap lace around the middle, then adhere to the card front. Cut a strip of white cardstock, then round the bottom corners. Stamp the sentiment to it, then add the chipboard letters below. 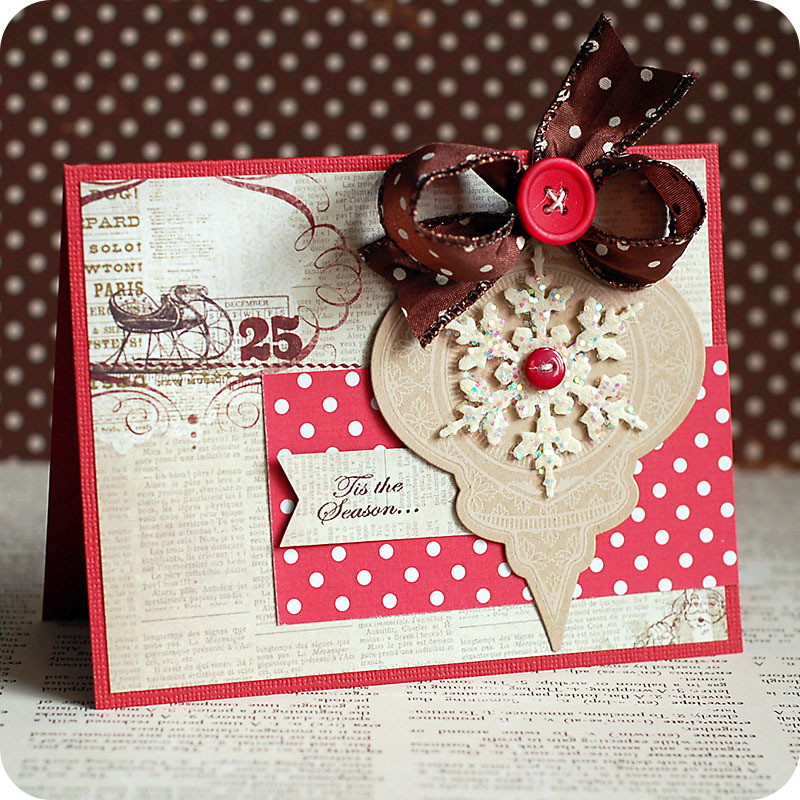 Adhere to the card front, and then accent the corner with chipboard snowflakes. 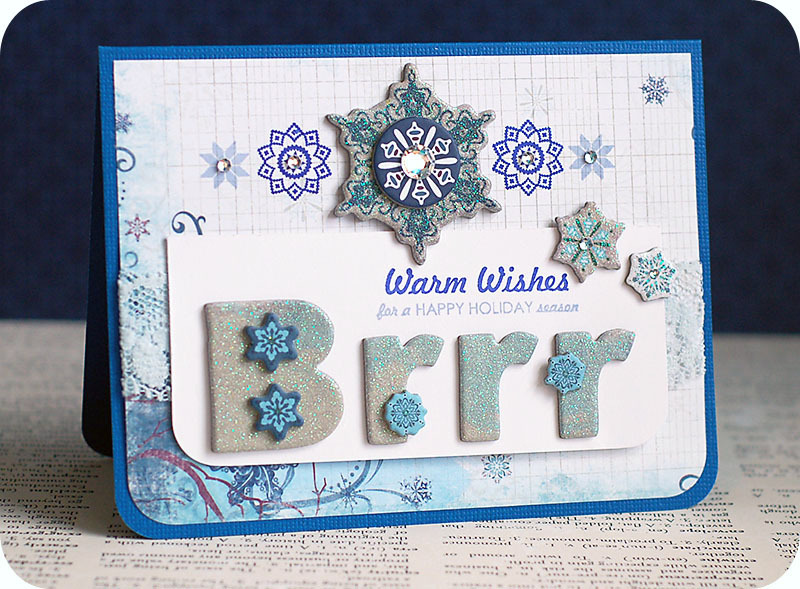 Stamp the snowflakes to the top of the card, then add the bigger chipboard snowflake to the middle. Accent with jewels to finish. Happy Saturday, everyone!! I hope that your weekend is off to a good start so far. We have a good friend of ours in from Salt Lake City right now, and last night we had a bunch of his family over and ate tons of Papa Murphy's pizza, chatted, and had a movie on for all the kids. It was a great night!! I have my card to share for CPS Sketch #240 this week, where we were sponsored by Clearsnap. This week we featured their new Colorbox Premium Dye ink by Stephanie Bernard. The prize this week is a collection of 8 colors of these dye inks....and you still have time to create a card with the sketch and link up to it!! The winner is normally picked when the next sketch goes up...so get to creating!! Here is the card that I created...all challenges it is for will be listed at the end of the post! Instructions: Make card from kraft cardstock, then round the opposite corners. Cut two squares of paper, round the opposite corners and adhere to the front. Wrap black lace around the middle. Cut a square of black cardstock and round the opposite corners. Do the same to a slightly smaller block of damask patterned paper, add two ribbon tabs to the top of it, and adhere to the black block. Adhere the entire block to the card front. Diecut & stamp the jar to vellum, then adhere a black label to the front of it. Adhere the jar to the orange block. Stamp the lid to dotted paper and cut out. Wrap lace around the bottom of it, and then wrap twine right above that. Stamp the tag & sentiment to cream cardstock, cut out and adhere to the lid. Tie a double bow from twine, thread a button around the middle and adhere to the top of the tag. Adhere the entire lid to the top of the jar, and then accent with fabric bats. Add two paper flowers to the bottom of the jar to finish. Happy Friday, everyone!! We have made it to the weekend!! Yay!! It is a gloomy, rainy day here in Missoula... our fall is going quickly and before you know it, winter will be upon us. I love winter for the first little bit...and then it just starts to get old. Tee hee! I love Montana though, and will take the winters so I can have the summers. I am back today to share a card I did for the Two Peas "Stamping A to Z" event. My card is for today's letter.... "L is for Lawn Fawn". 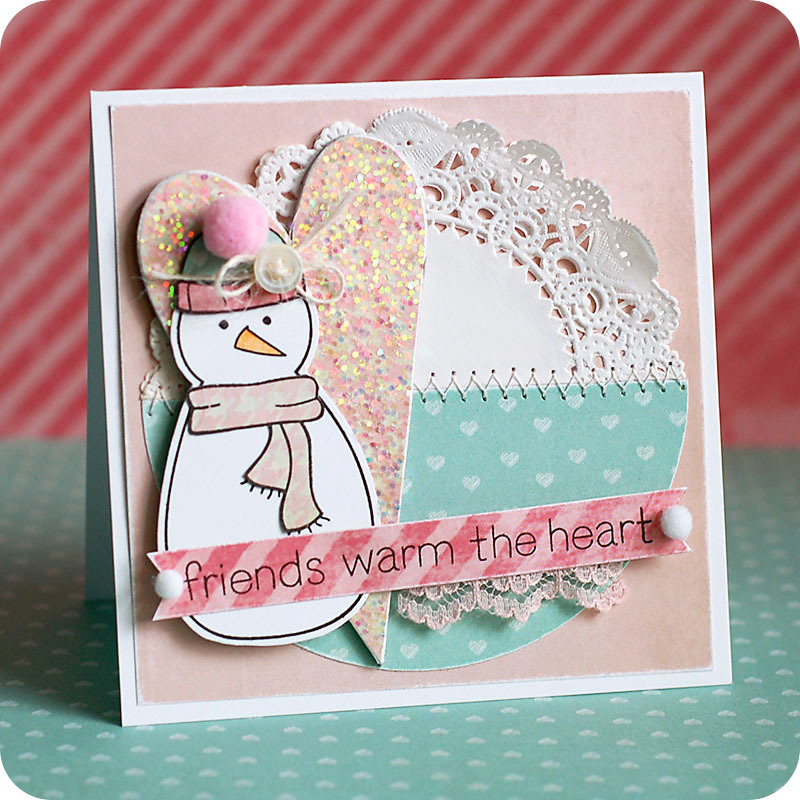 I created a cute little winter themed friendship card using "Making Frosty Friends", which went perfectly with some Glitz Design "Beautiful Dreamer" papers. I created this for some challenges as well, and those will be linked at the end of the post. Here is what I made! Instructions: Make card from white cardstock. Cut pink paper slightly smaller and sand the edges. Cut a 4" circle from aqua heart paper using your Cricut Expression. Cut the circle in half, sand the edges and layer to the bottom of the pink block. Fold a doily in half, and adhere to the top of the pink block. Zig zag stitch along the seam, and then adhere the entire block to the front. Cover a chipboard heart in houndstooth paper, and sand the edges. Then cover it in chunky glitter, and adhere to the front. Stamp the snowman to white cardstock, cut out and color in the nose. Stamp the scarf and hat to patterned papers, and cut out. Layer to the snowman, then adhere it to the card front. Accent the hat with a twine bow, button and pink pom. Cut banner edges to a strip of striped paper and then sand the edges. Stamp the sentiment to it, adhere a strip of lace to the bottom of it, and then adhere to the front. Accent the sentiment banner with white poms to finish. Happy Thursday, everyone!! It is the 20th of the month, which means it is time for the Taylored Expressions Key Ingredients blog hop!! The October Key Ingredients kit is full of gorgeous Crate Paper "Farmhouse" collection, and the rich colors & patterns are perfect for the fall season we are in right now. But the great thing about the papers is that they are very versatile, and can really be used for any sentiment and theme. The kit also includes a fabulous strip of frilly orange blooms...and those are probably my FAVE part of the kit this month. They come on a strip of netting, but as you will see on my card...you can easily cut them off the netting and use each bloom by itself. That way they can make multiple cards, rather than just one or two. I have created my card for some challenges as well, and those will be listed at the bottom. Here is what I created!! Instructions: Make card from light green cardstock. Cut floral paper slightly smaller, and adhere a strip of orange paper to the bottom of it. Tie ribbon around the seam, and then adhere a flower & brad to the center of the bow. Cut a banner end to cream cardstock, then distress ink the edges. Stamp the sentiment to the banner, and then adhere slightly tucked into the floral accent. Adhere the entire floral block to the card front using foam adhesive. 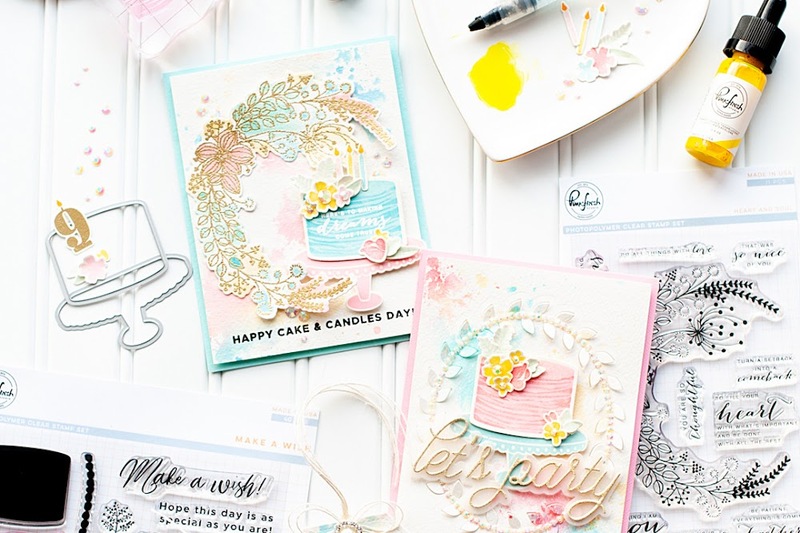 Be sure to check out what the rest of the Key Ingredients designers have created for today's blog hop...it is sure to be a treat! Happy Wednesday, everyone!! Can you believe that it is the middle of the week already?! I feel like time has flown so far this week!! 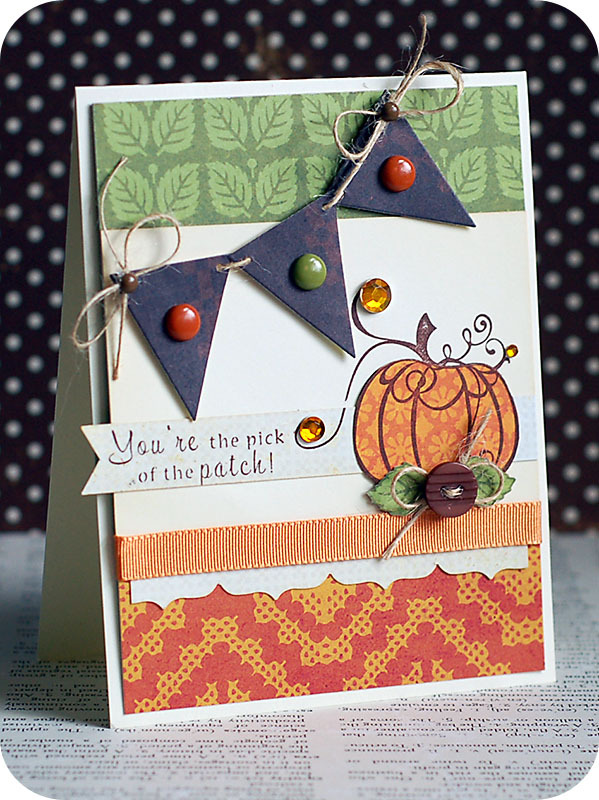 Today I am participating in the October "Blast from the Past" blog hop by Taylored Expressions! I used the October Key Ingredients kit for it, which was a perfect fit! 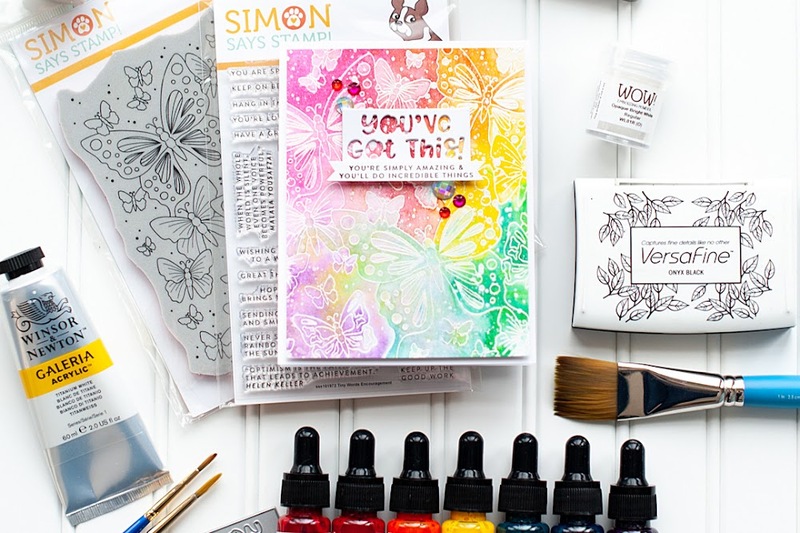 It is such a fun little kit to get in the mail every month, and even better...it is completely geared towards card makers!! 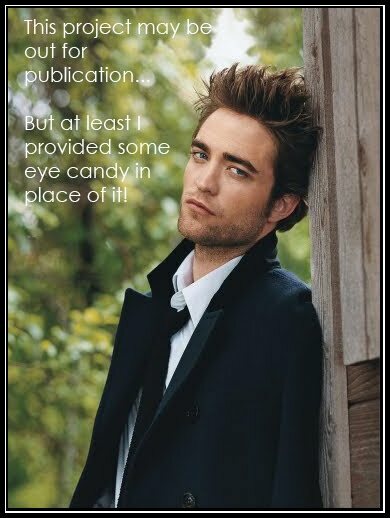 The theme for this blog hop is Trick or Sweet, but I had to fudge just a little bit. I don't have a Halloween stamp set from Taylored Expressions, but I do have a fall/Thanksgiving theme set, and a sentiment set that allowed the card to be considered a Halloween card. Nothing spooky, but still a pretty little pumpkin and sweet sentiment to match! I have created it for some other challenges as well, and those will be linked at the bottom. Here is what I came up with! Instructions: Make card from cream cardstock. Cut orange patterned paper slightly smaller, then adhere a block of cream cardstock across the middle of it and green leaf paper to the top. Punch an upper crest border to white patterned paper, adhere below the cream cardstock and then cover the seam with orange ribbon. Cut a banner edge to white patterned paper, and then stamp the sentiment to it. Adhere to the left side of the cream cardstock block, going slightly over the left edge of the card. 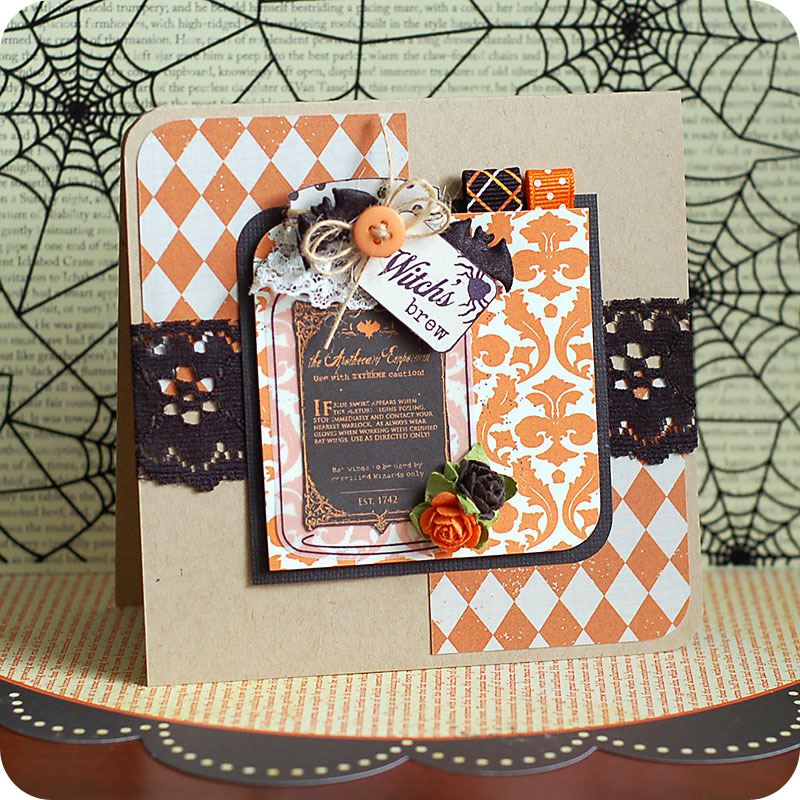 Stamp the pumpkin directly to the card front, and to orange patterned paper. Cut out orange pumpkin layer, and adhere to the card front. Cut two green leaves from patterned paper and adhere to the bottom of the pumpkin. Tie a bow from twine, thread a button around the middle and adhere to the top of the leaves. Accent the pumpkin swirls with jewels. Cut three pennants from brown patterned paper, and then adhere a brad to the middle of each one. Thread the pennants onto a string of twine, and adhere to the upper left corner of the card. Add two bows to each corner, and then accent the middles with small brad tops to finish. Good Tuesday morning, everyone!! I hope that you had a wonderful rest of your weekend, and a great start to your week!! Today's post comes with a little bit of sadness, but also happiness for the owner of Stamper's Dream. Michelle has decided that it is time to focus more on living her life, and will be closing down Stamper's Dream. I have had a great time being a team member this year, and I wish Michelle all the best in the future!! This will be the last blog hop that we participate in, so be sure to hop along and leave everyone a little bit of love! Everything in the store is 20% off with the coupon code Farewell2U. Just enter on the checkout page in the coupon section and it will take 20% off the lowest marked price of the items in your shopping cart! There is a $20 minimum to activate the coupon, and there will be no free shipping during the liquidation. I decided to create a festive Christmas card for this blog hop! Of course, I have created it for some challenges...and those will be listed at the bottom! Here is what I created! Instructions: Make card from red cardstock. Cut text paper slightly smaller, and adhere to the front. Cut a strip of red dot paper, and adhere to the right side of the card. Stamp the ornament to kraft cardstock, then diecut. Pull the button off the snowflake, glitter it, then adhere the button back to the middle. Adhere the entire snowflake accent to the middle of the stamped ornament, then adhere it to the right side of the card. Tie a bow from dotted ribbon, thread a button around the center of it with twine, then adhere to the top of the ornament. Cut a banner edge to a strip of text paper, stamp the sentiment to it and adhere it slightly tucked under the left side of the ornament. Don't forget to go hopping along to each designer's blog for some lovely inspiration!! Two Peas in a Bucket has an event going on called Stamping A to Z right now, and I am one of the guests for today's post, G is for Glitz Design & Glossy Accents. Of course, I did a project using Glitz Design product for them. You could be one winner of some amazing Glitz Design product (and more!!) this week...just check out the 2Peas event blog that I linked above for details!! Here is the card that I created for this event. I did create it for some other blog challenges too, and those will be linked at the bottom! Instructions: Make card from vintage cream cardstock, and distress ink the edges. Cut a pink paper block slightly smaller, distress the edges, and adhere to the front. Cut a smaller vintage cream cardstock block, and distress ink the edges. Sand the edges of butterfly ephemera, and adhere a strip of lace to the left side of it. Tie tulle around the bottom of it, accent the middle of the bow with a button, and then adhere the entire piece to the cream cardstock block. Cut a very thin strip of striped paper, and adhere to the right side of the butterfly image. 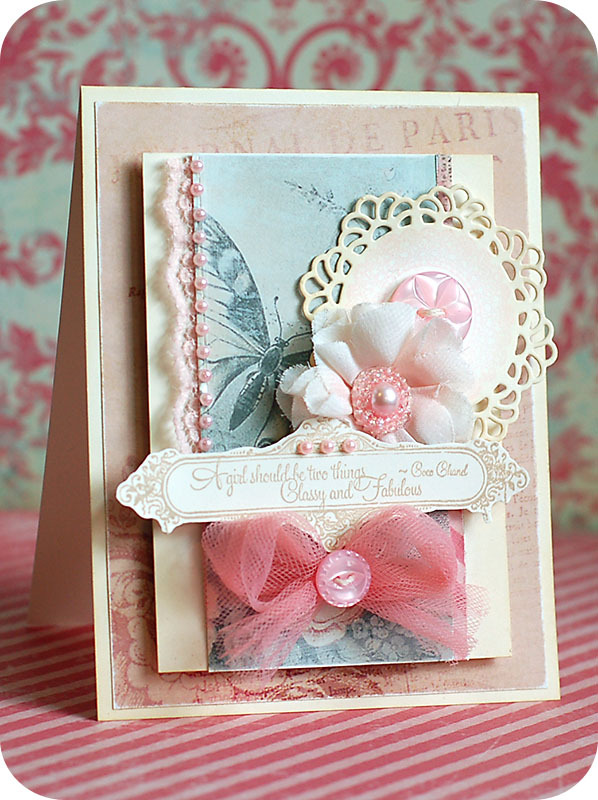 Accent the lace edge with a strip of pink pearls, then adhere the entire block to the card front using foam adhesive. Diecut a doily from vintage cream cardstock, stamp the doily to the middle of it, then distress ink the edges. Thread a button with twine, and adhere to the middle of the doily cut. Adhere the entire cut to the card front, along with a pink flower. 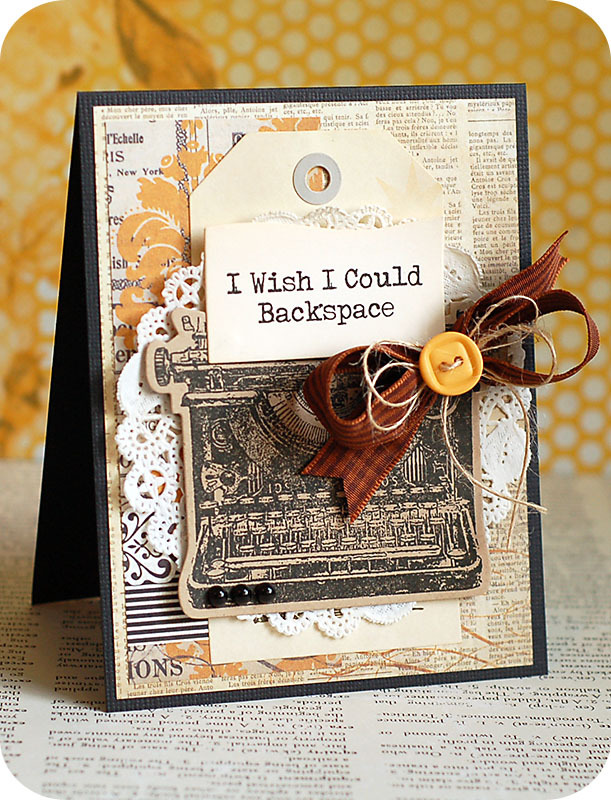 Stamp the sentiment label to vintage cream cardstock, cut out, and adhere to the card front as shown. Accent with pink pearls to finish. Happy Thursday, everyone!! So- can you feel it? The weekend? It's almost here....YAY!! Time for some college football, and staying cozy & warm at home! Hopefully I will get some crafty time in too...weekends seem to be hit or miss with me these days. I have a fun little Halloween card to share with you today! It is my card for CPS Sketch #239, where we were sponsored by Want 2 Scrap this week. Of course, I created this card for some other challenges, and those will be listed at the bottom. Here is my card! Instructions: Make card from black cardstock. Cut spiderweb paper slightly smaller, and distress ink the edges. Wrap lace and ribbon around the middle of it, then adhere to the front. Cut a 1" by 12" strip of star paper, scor in 1/2" increments, and fold together. Adhere the ends together, then fold into itself and glue to a peice of cardstock to create the larger accordion flower. Do the same steps with a 1" by 6" strip of orange dotted paper. Layer the two accordion folded flowers to the right side of the card, then accent the middles with a felt ghost and twine threaded button. Tie a bow from matching ribbon, thread a jeweled ribbon charm through the middle, and adhere to the left side of the accordion flowers. Cut a banner edge to a cream cardstock strip, distress ink the edges and then stamp the sentiment to it. Wrap the left side around a pumpkin topped pin, and then stick into the top of the bow. 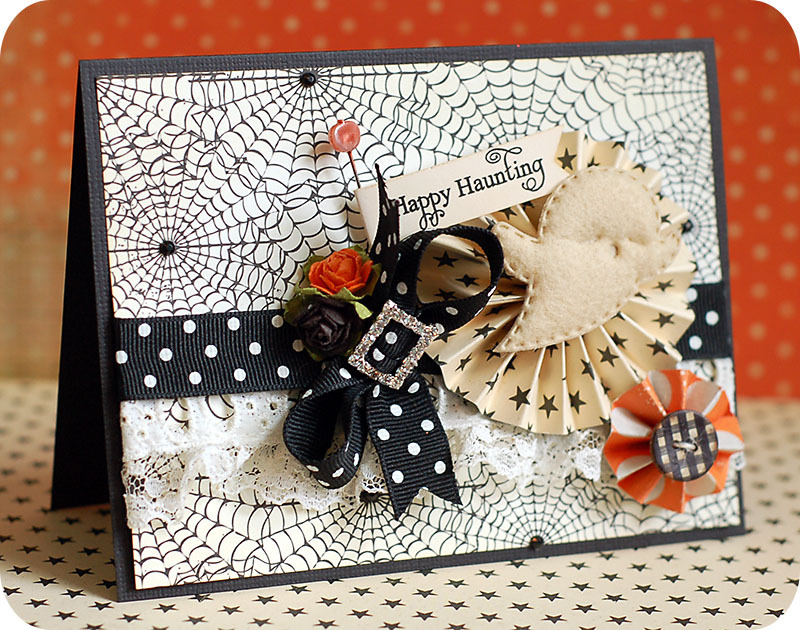 Accent the side of the bow with two paper flowers, then add black jewels to the spiderweb paper to finish. Happy Wednesday, everyone! I hope that your week has been a good one so far! Looks like we are half way to the weekend, which is always a good thing! It is inspiration week for the Taylored Expressions October Key Ingredients kit, and my post went up this morning on the Key Ingredients Blog. If you haven't heard of Key Ingredients, it is a kit geared towards card makers, and comes with beautiful 6x6 patterned papers, matching 8.5x11 cardstock sheets, ribbons, and a package of some type of matching embellishments like brads, buttons, chipboard, etc... You can check out the FAQ Page to answer any questions you might have, and you can Subscribe Here if you think it is a kit that you would like to get every month!! The October kit features papers from the Crate Paper "Farmhouse" collection, which are full of rich color and beautiful patterns. They work wonderfully for Fall or Thanksgiving themed projects, but would also work for so many other occasions. I love it when patterned paper can serve many functions...it gives it even more value. And in this economy...value and "bang for your buck" is a good thing! Here is the card that I created...and the challenges that I've created it for are listed below. Instructions: Please see my Key Ingredients blog post. Good evening, everyone! Welcome to the last night of October's Lawn Fawn inspiration week! Tonight we are showcasing the new set "My Cup of Tea"....I am sure you can guess the theme. Tee hee! I combined the set with two others in order to really customize the sentiment. I should preface this by saying that my mom loves ALL dishes. I don't think she has ever met one she didn't like...well, unless it had a chip. Tee hee! She also LOVES beautiful teapots and matching teacups and/or mugs, depending on the style. When I saw this stamp set, I immediately thought of her. So, I wanted to make this card in honor of my wonderful mama...so the sentiment had to be just for her! The challenges that I created this for will be listed and linked at the bottom of my post. Here is what I came up with! Instructions: Make card from purple cardstock. Cut damask paper slightly smaller, then cover the top with yellow dotted paper. Wrap green crocheted lace around the middle, then adhere to the front. Fold ribbon ends as shown, then adhere to the middle of the lace. Diecut the label from cream cardstock, distress ink the edges and adhere to the middle. Tie a double bow from twine, thread a button around the middle and then adhere to the lower left corner of the label. 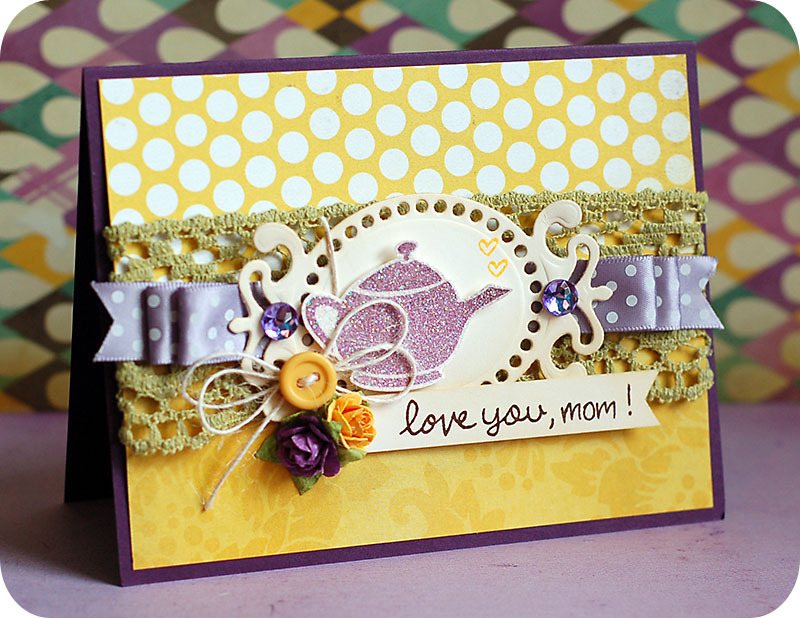 Stamp the teapot to cream cardstock, cut out and cover in glitter. Adhere the teapot to the label, overlapping the twine bow, then stamp the hearts coming from the spout. Cut a banner edge to a cream cardstock strip, distress ink the edges and stamp the sentiment to it. Adhere below the label, and then accent the left side with two paper flowers. Add purple jewels to the label to finish. So, this stamp set begs the question... what is your favorite kind of tea? I live in Montana, so I am a lover of hot drinks when it is cold outside- which is a LARGE portion of the year. Apparently I am very "British" when it comes to how I prefer my tea...because unless it is mint or orange tea- I prefer cream and a bit of sugar (splenda) in mine. My latest tea fave is this cinnamon tea I picked up in Kenya. There aren't many just plain cinnamon teas out there that I fancy...but I LOVE this one. I will be so sad once it is all gone...which means I will just have to plan another trip to Kenya! Tee hee! I have this coconut chai tea that really love too, and it is decaf. And I can't forget the one forever favorite- Constant Comment orange tea. My girlfriends and I used to sit in Perkins for hours, just chatting, eating a slice of pie and making as many cups of tea possible with the one teabag we each had. Such good memories from high school and college. And as always, there will be lots of giveaways on the Lawn Fawn blog this week!! Click on these links and follow the comment instructions for your chance!! Good evening, everyone!! Welcome back to day 2 of the October Lawn Fawn inspiration week!! Tonight we are showcasing a new alphabet set called "Sally's ABCs". This alpha set is perfect for Christmas and holiday cards...it just has that certain feel to it!! It also works really well with the other alphabet stamp sets in the Lawn Fawn collection, as you will see on my card!! I did create my card for some challenges, and those will be listed at the bottom of the post. Here is what I came up with using "Sally's ABCs" stamp set! Instructions: Make card from red cardstock and ink the edges. Distress ink a strip of lace and then wrap around the bottom of the card. Cut green damask paper slightly smaller and sand the edges. Diecut the doily from cream cardstock, distress ink the edges and adhere to the bottom of the paper block. Sand the edges of the vintage image and adhere to the top of the doily. Adhere the silver vine to the right side of the image, then cover the bottom with a floral accent. Add a jewel to the middle of the flower. Cut a banner edge to cream cardstock, distress ink the edges and stamp the sentiment to it. Adhere right below the vintage image, with the right side tucked into the flowers. Adhere the entire damask block to the card front using foam adhesive to finish. Hey there, everyone! So- I created a card this afternoon that isn't for any DT work & such....and decided that I needed to share it right away! For one, I created it for some challenges that will be ending soon, and second- I don't often have a lot of time to create something "just because" these days. I always seem to be working on some assignment or deadline...so it was kind-of nice to just take a minute to grab whatever I wanted to use and go to town! Like I said before, I did create this with some challenges in mind...and those will all be listed at the bottom. Here is what I created with some of my extra time today!! Instructions: Make card from black cardstock. Cut kraft cardstock slightly smaller, distress ink the edges and adhere. Cut dotted paper slightly smaller, distress ink the edges, wrap black lace around the top and adhere. Distress ink a doily and adhere to the upper left corner. Diecut and stamp the typewriter to kraft cardstock, and adhere to the doily. Tie a gingham bow, thread a button around the middle with twine, and adhere to the upper right corner of the stamped typewriter. Add two flowers to the lower left corner of it. Cut a banner from kraft cardstock, distress ink the edges and stamp the sentiment to it. Adhere the sentiment banner to the lower right corner of the card, then accent with black pearls to finish. Hey there, everyone!! Today starts inspiration week for Lawn Fawn!! 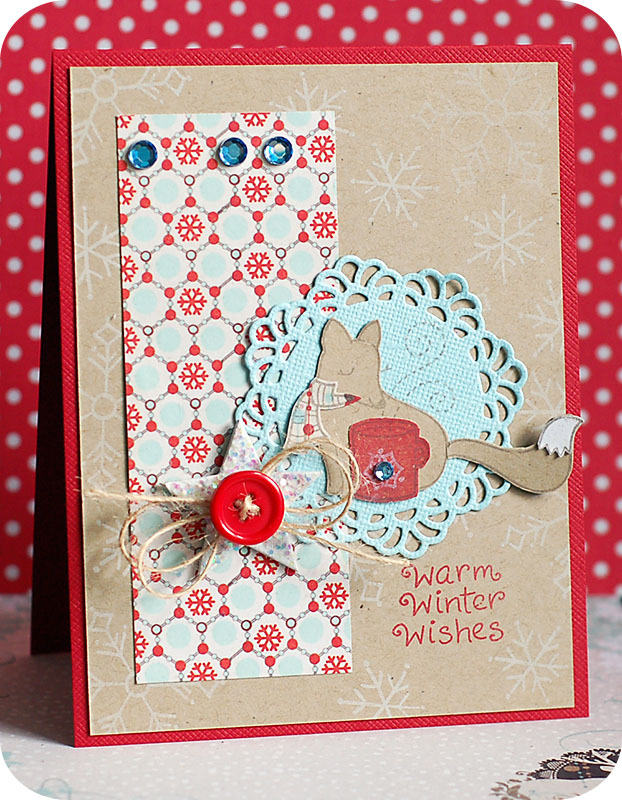 Today we are showcasing the little mini set called "Winter Fox", which is super cute!! Instructions: Make card from red cardstock. Cut kraft block slightly smaller, then stamp sentiment and snowflake background to it. Adhere a dotted strip of paper to the left side, and then adhere the entire block to the card front. Diecut the doily from blue cardstock. Stamp the fox to the doily, and all the paper layers needed. Cut out each section, layer together, and adhere the fox to the doily. Adhere the entire doily to the front of the card, just above the sentiment. Paint a chipboard star, cover in chunky glitter and adhere to the front. Tie a double bow from twine, thread a button around the middle, and adhere to the middle of the star. Accent the fox's mug and the top of the dotted paper strip with jewels to finish. Hey there, everyone!! Have you had a great day so far? I certainly hope so! We had to get up EARLY to do our monthly mission's fundraising project this morning in the icky rain...and ever since then I have been exhausted. So- needless to say, it hasn't been the most productive day for me. But that's okay...everyone needs to have days like that! I have my card to share with you for CPS Sketch #238, where we were sponsored by The Cat's Pajamas this week. I also created my card for some other challenges, and those will all be listed at the bottom of this post. Here is what I created! 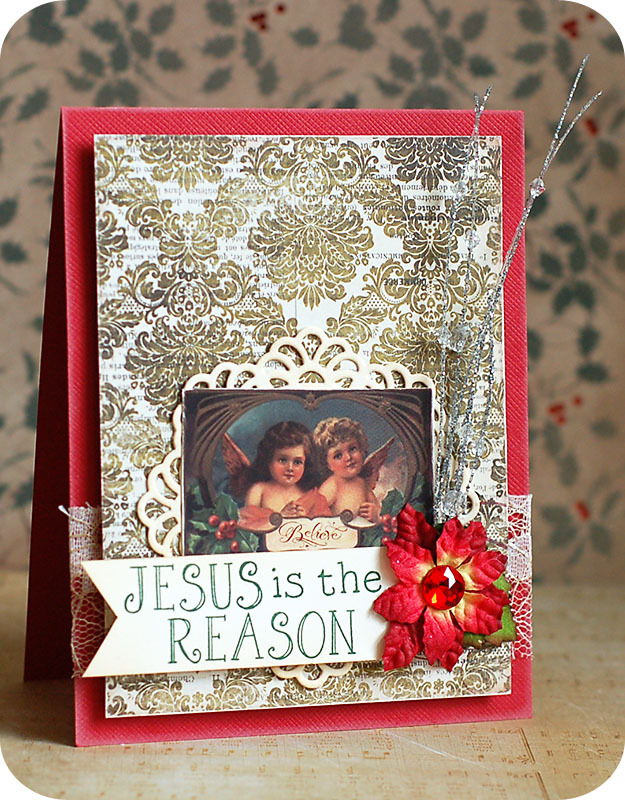 Instructions: Make card from vintage cream cardstock, then distress ink the edges. Distress ink the edges of a purple paper block, and three strips of patterned papers. Adhere the three smaller strips to the middle of the card. Zig zag stitch along the edges of the purple block, and along each seam of the paper strips. Adhere the entire stitched block to the card front. Distress ink the edges of a texted paper block, and stamp the nest to the lower left corner. Adhere the stamped block to the top of the card. Diecut the banners, sand the edges of each piece and layer together. Adhere each banner to the bottom of the heart epherma, and adhere to the top of the card. Thread three buttons with twine, and adhere to the hearts. Stamp the silhouetted bird to cardstock, cut out, and adhere to the right side of the stamped nest. Tie a double bow from cream seam binding, and adhere to the lower left side of the stamped nest, then accent the middle with paper flowers. Cut a banner edge to a vintage cream cardstock strip, distress ink the edges and stamp the sentiment to it. Accent with three pearls, then adhere to the card front to finish. Hey there, everyone!! Well, today is the day! You can purchase all of the new WPlus9 stamps, and don't forget about the free "Dear Santa" set with a $30+ purchase!! Such an awesome deal...you won't want to miss out. For the final day of release week, we have our group post...which I just LOVE! I love seeing a project from each DT member on Dawn's blog together...so many different styles encompassed!! I did create my card for some challenges, but I have decided to change my post format and share them at the bottom. That way it will be easier to see each challenge, and click on the links. So, just scroll down to see which ones I used!! 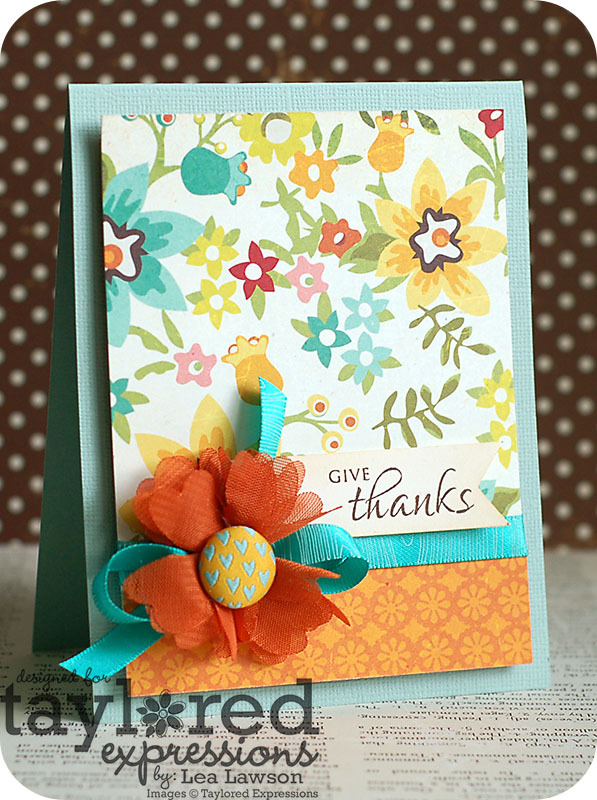 Instructions: Make card from vintage cream cardstock, then distress ink the edges. Ink the edges of a brown paper strip and adhere to the left side of the card. Ink the edges of a pink houndstooth paper block, and adhere to the right side. Cut a strip of vintage cream cardstock and distress ink the edges. Stamp the border to it, adhere lace trim to the left side, and then adhere to the middle of the card. 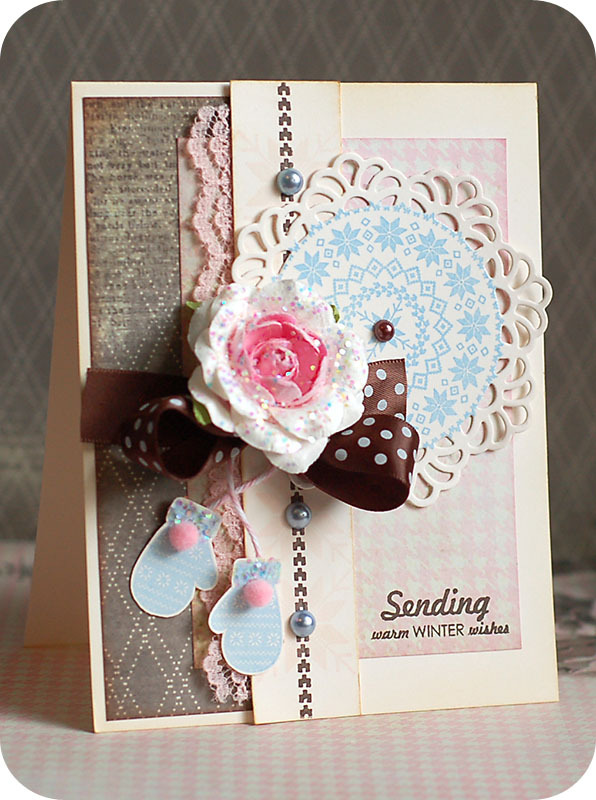 Diecut the doily from vintage cream cardstock, stamp the inside and adhere to the front. Add three pearls to the snowflake border, and a pearl to the middle of the doily. Stamp the sentiment to the lower right corner of the pink paper block. Tie a bow from brown dotted ribbon, and adhere to the left side of the doily. Cover a pink flower in glitter, and adhere to the middle of the bow. Stamp the mittens, cut out, and cover the tops with glitter. Adhere each mitten to a piece of pink twine, put a twist in it and adhere below the bow. Add two pink puff balls to the mittens to finish. Be sure to check out what the other girls have to share for the group post...I know each project is going to be fabulous! I can't wait to check them out! Happy Tuesday, everyone!! Today is the full reveal of the October WPlus9 stamps that will be for sale tomorrow! You can head over to Dawn's blog to see the stamp sets in their entirety...I think you are going to just LOVE them!! I know that I do! I wanted to showcase that these Christmas themed stamps don't have to just be used for the holidays....and I happened to pair them with "Season of Thanks". That is one of the things that I really love about WPlus9 stamps...you can often mix and match them to create exactly what you are looking for! I created my card for quite a few challenges today. I used Mojo Monday sketch #209 to help with the card design. 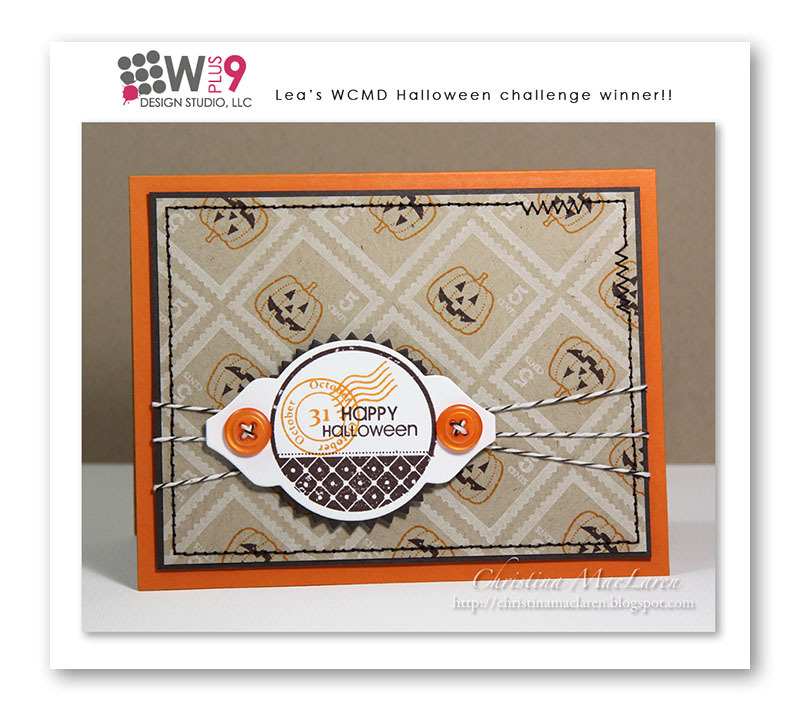 By adding a pumpkin to the card, it fits Stampin' Sisters in Christ #109- Fruits challenge. I used the fall/pumpkin themed inspiration photos from Moxie Fab Tuesday Trigger: Treat Yourself, The Shabby Tea Room #82, Stamptacular Sunday challenge #132, Cupcake Inspiration challenge #130, and Our Craft Lounge #85. It also fits the Autumn/Changing of Season themes for Totally PaperCrafts challenge #86 and The Stamping Boutique challenge #16. Here is what I created! 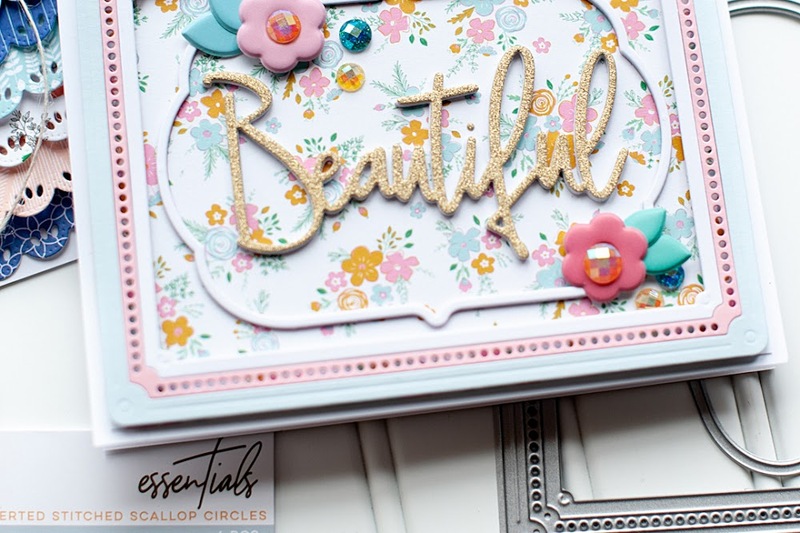 Instructions: Make card from vintage cream cardstock, and distress ink the edges. Diecut a scalloped border from orange dotted paper, and adhere to the right side of a yellow floral block. Sand the edges and adhere to the card front. Stamp the border to the left of the paper block. Distress ink a block of cream cardstock, then matte on dark brown cardstock. Stamp the frame, sentiment and acorn it, and then adhere to the card front. Tie seam binding around the upper left corner of the card. Tie a double bow from the same ribbon, thread a button around the middle of it using twine, and then adhere to the the front. Stamp the pumpkin and leaves, cut out, and layer to the lower left corner of the stamped block. Tie a small bow from twine, thread a button around the middle of it, and adhere to the top of the leaves. Thread another small button with twine, and adhere to the right side of the stamped frame to finish. Don't forget to check out what all the other WPlus9 designers have to share today! I am sure it will be a treat! Happy Monday, everyone!! I hope that the start of your week has been a good one!! I am having coffee with two of my girlfriends this morning, and am so looking forward to it!! We are trying to meet every couple of weeks for coffee in order to stay in touch better, and keep up with each others lives. How awesome is that?! If you purchase all 3 of the WPlus9 newly releasing stamps....you will get this little cutie for free!! Or, grab a couple sets that have been on your wish list for awhile...I am a sucker for deals, so I love that Dawn is offering this one up! I created my card for a couple of challenges, of course. Tee hee! I combined Eat Sleep Stamp sketch #149 & 365 Cards: Super Sketchy Sunday #216 because they were quite similar. I also created it for The Kraft Journal challenge #39, which is all about lavish layers...one of my very favorite techniques!! And because I used my very favorite technique, it also fits Wee Memories challenge #70. Here is what I came up with! Instructions: Make card from kraft cardstock. Cut background paper slightly smaller, and sand the edges. Cut a strip of dotted paper, sand the edges and adhere to the back of the background paper, leaving the upper right corner adhesive free. Adhere the entire block to the card front, then curl the top right corner over to reveal the polka dot paper. Tie a double bow from twine, thread a button through the middle and adhere to the curl. Cut a striped paper block, sand the edges and adhere at a slight angle to the front. Cut a dotted paper strip, sand the edges and adhere across the middle. Diecut a spiral notebook cut from white cardstock, then stamp the topper & list lines to it. Adhere it to the front of the card at the opposite angle of the striped paper block. Add the felt accent to the left side of the numbered lines. Cut a banner edge to a kraft cardstock strip, then finish the sentiment with foam letters and a heart jewel. Adhere the banner to the front, tucked under part of the felt accent. Finish by accenting the stamped topper with jewels.